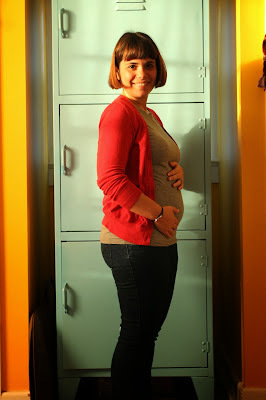 Bossy Italian Wife : Some Pregnancy "Rules" I BREAK! Me at 11 weeks! Check out my little bumpity!!! As any pregnant woman will agree, there are a ton of rules when it comes to being pregnant. There are things you can't eat (lunchmeat, sushi, brie cheese! ), things you can't drink (caffeine in the first trimester, alcohol which is questionable....), and things you can't do (super cardio workouts, heavy lifting). With all these rules floating around, sometimes it's hard to say what is or is not "in bounds." In fact, many other moms have told me, "you just have to decide for yourself." Every woman will be different. Some will be very strict about some things and loose about others. You just have to do what is right for you in the end and people telling you what you can and can't do only goes so far. I get it, though, really I do because people really like to be all judgy-wudgy about parenting and it begins before you are even a parent....some of friends without children know what I mean because they are constantly getting questions about when they are going to do it (it's annoying, right?!) So, to make my fellow preggo friends breathe a sigh of relief, I wanted to share my little list of rules that I am a-breaking. My primary care physician's assistant acted like I was doing something truly horrible by not getting a flu shot while pregnant. It made me uncomfortable, honestly....she actually used the words "life or death." Dramatic, right? I have never in my life gotten a flu shot and my motto is: if I didn't do it while I wasn't pregnant, why would I start now? Yes, I do! You'll find raw honey on the "no no" food list and I get it...there is a slight risk of botulism. But every time I walk out of my front door, there is a slight risk of all kinds of things that I don't want to get into. I believe in the homeopathic value of raw honey during cold season...and well, since I didn't get that dang flu shot, I guess I better keep up on the honey! I'm not making a "birth plan." Seriously? What would be the point? I can tell you now that I am planner, so this isn't the most in character thing for me to pass on, but I feel there are some things you just can't plan for. My plan? To show up when I go into labor and have a baby--however that happens. Sure, I have hopes of how it may turn out, but the ball is definitely not going to be in my court. So, eh, not doin' it. Sure, I could go sans caffeine for the entire pregnancy. I'm a half a cup of coffee a day kind of gal, so I am sure I'm not addicted. But let's face facts...I have given up enough! Since I am in the second trimester, I am switching back to regular coffee. The only reason I haven't yet? I bought this decaf for the first trimester (because the intake of caffeine in the first trimester is riskier) and I'm cheap, so I want to finish it. Well it's a short list, but it's a list nonetheless. I hope you all will share with me what rules you are breaking, or broke, during your pregnancy in the comments sections below! Thanks so much!! And you are right, it's a tiny cup.